NEW 50 YEAR OLD BOOK!!!! This book was written in 1968. It was designed, edited, and published in late 2017. What was it like growing up on the Canadian prairie 100 years ago? 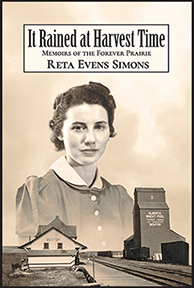 In a charming conversational manner, Reta Evens Simons gives vivid and often amusing details of her hard life as a pioneer’s daughter on a wheat farm out west, far from almost anywhere. Including both words and illustrations, her memoirs combine personal experience with descriptions of her times and place that make history come to life. It Rained at Harvest Time balances between Reta's childhood point of view and her perspective as the adult author looking back with critical distance. She documents technological advances that transformed farming. She also provides a lyrical portrait of the “forever prairie” itself. It was a place where lassoing gophers could be entertainment, where canned tomatoes made a special dessert, where indoor plumbing was beyond imagining, and a caravan of Gypsies showed up to run carnival games at the town fair. Most days, after milking the cows, she herded a passel of younger siblings to and from school. (One morning their pet badger came too). Mom fixed and fed babies at home. Dad worked the vast wheat fields and knitted their socks and hats on a strange contraption. Reta describes carefree moments spent picking wild roses, but also tells of the time she was a panicked little girl alone on a wagon full of wheat, reining in a team of horses, racing down a steep hill. Her words and sketches map out a landscape filled with colorful personalities of both the human and animal kind. She recounts their adventures and tragedies as well as her own journey of self-discovery. These are true tales from a girl who never saw an umbrella 'til she was 14 years old. And because it rained one harvest day, her life changed forever.